Lindsay Linton is based in Jackson, Wyoming, where she specializes in portrait, editorial and commercial photography. Her multi-faceted background includes documenting the generational farming families of her hometown in Powell, Wyoming, Been Here For Generations, through environmental portraiture and historical narratives, to assisting world-renowned headshot photographer, Peter Hurley, in New York City. She is also a dancer and designs performances for events and other projects. 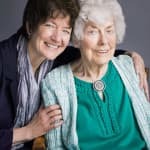 The success that young mothers find through Wyoming’s CLIMB program can be traced to the foundation of the mother-daughter bond between Pat Fleming and her daughter Dr. Ray Fleming Dinneen. Owly, Gus and Ruby are resident raptors at the Teton Raptor Center — a rehabilitation, conservation and educational facility in Wilson, Wyoming. Each has a permanent disability which prevents them from being returned to their natural habitat. This combination of photographs and texts documents seven Powell families who still farm the original homestead and in most cases, live on the early home site. An inherent love for the lifestyle has trickled down from generation to generation--the third, fourth and even fifth who presently farm share a passion to cultivate the land with their ancestors, even though the technology and means of production of agriculture have drastically changed. A strong connection to the land coupled with an unyielding love for the farming way of life has kept the original, early century homestead in these families for decades.